SOLAS™ MonoDense™ is a proprietary process for the industries first monodense fully porous silica particle for use in HPLC and UHPLC. 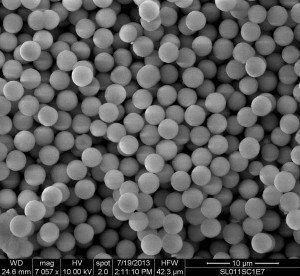 Have you ever imaged fully porous silica particles using state of the art focused ion beam (FIB) milling techniques (normally utilised in microfabrication environments)? If you did you would find that the inside of traditional fully porous silica particles contains voids or holes. These voids can be up to an order of magnitude bigger than the pore size of the silica. These holes or voids cause mass transfer issues which can lead to peak broadening, peak tailing and ultimately losses in efficiency. By comparison the SOLAS™ MonoDense™ particles are monodense and contain a homogeneous pore structure which allows for the efficient transfer of analytes into and out of the silica pore structure, thereby leading to more efficient and effective chromatography. Additionally, the Glantreo particles represent a media that is easier to pack with a reduced failure rate in packing.